This recipe is so easy that I almost didn’t publish it. It’s not really a recipe as much as alternate cooking instructions. A new friend told me about it, and I honestly didn’t believe it would work, but I needed something for Sunday brunch. 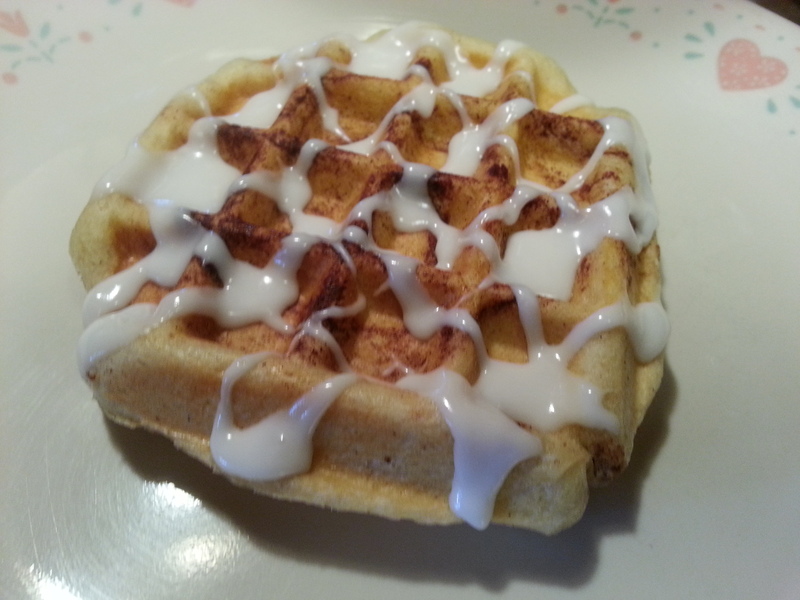 The idea of serving cinnamon roll waffles was just too tempting. I decided to give it a try. All that you need is a package of the large size cinnamon rolls found in the refrigerator section of your local grocer and a waffle iron. Yes, you heard correctly. There is only one ingredient. Heat your waffle iron and spray with non-stick spray, then place one cinnamon roll in the center of each waffle section. This iron makes two waffles, so two cinnamon rolls were placed onto it. The lid of the waffle iron is closed and you wait until the light on your waffle iron tells you that your cinnamon roll is cooked. 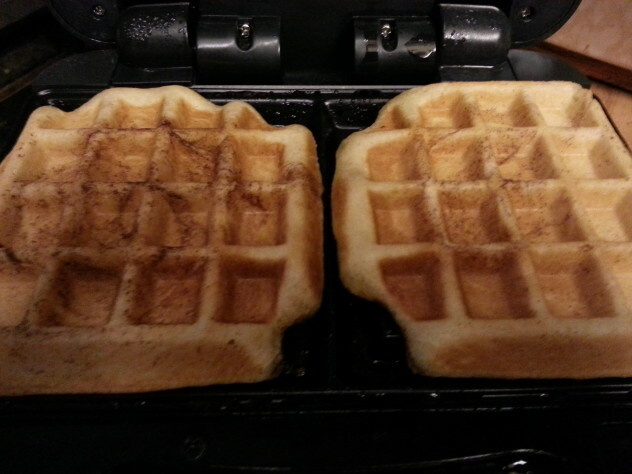 This waffle iron makes Belgian Style Waffles. Each pair of waffles took about 3-5 minutes. Once the waffles were finished, we plated them and drizzled the top with the icing that came in the package. It was that simple. Even Sue Chef, who thought that the idea of cooking cinnamon rolls in a waffle iron was very strange, agreed that they were good. Bus Boy devoured two of them and said they were delicious, and he’s my picky eater. 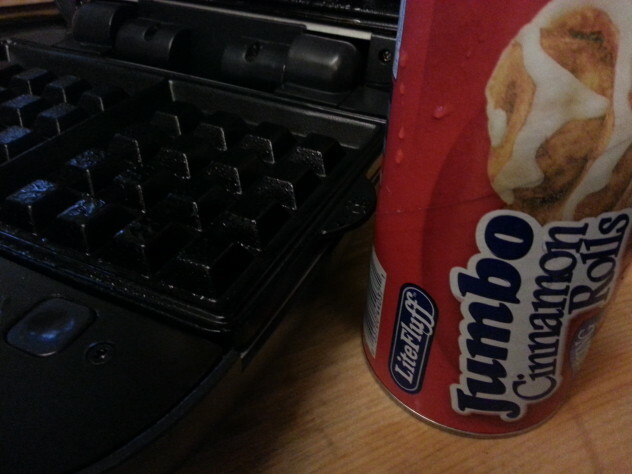 Food Critic complained that they weren’t fluffy like a regular waffle and were more dense than a regular cinnamon roll. 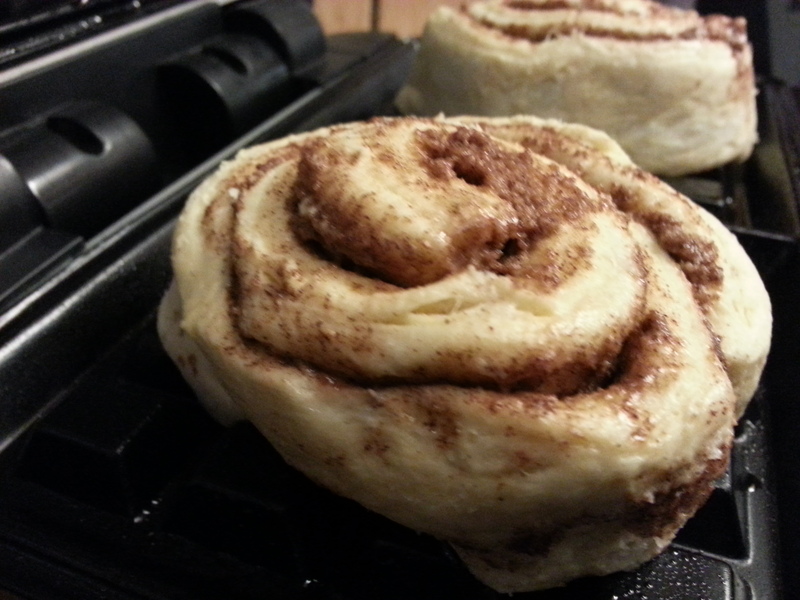 Baker’s Man and I agreed with these observations, and wondered if using smaller cinnamon rolls would resolve these problems since the cinnamon rolls wouldn’t be so tightly compressed if there was less dough. 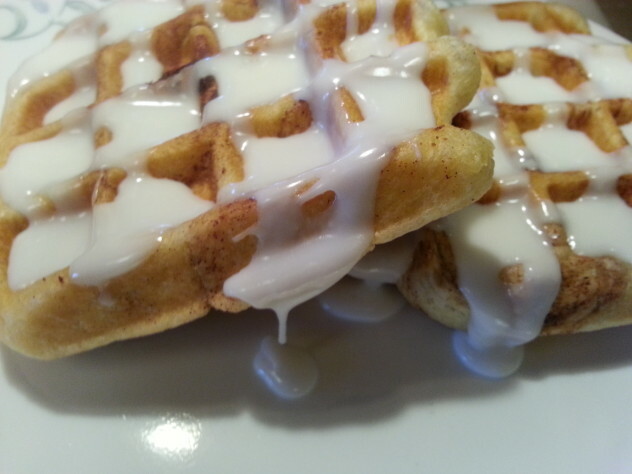 In spite of these issues, we all agreed that the cinnamon roll waffles will be making another appearance on our weekend breakfast menu. The waffles can be served alone, or as part of a full breakfast. We opted to have them with eggs and sausage. 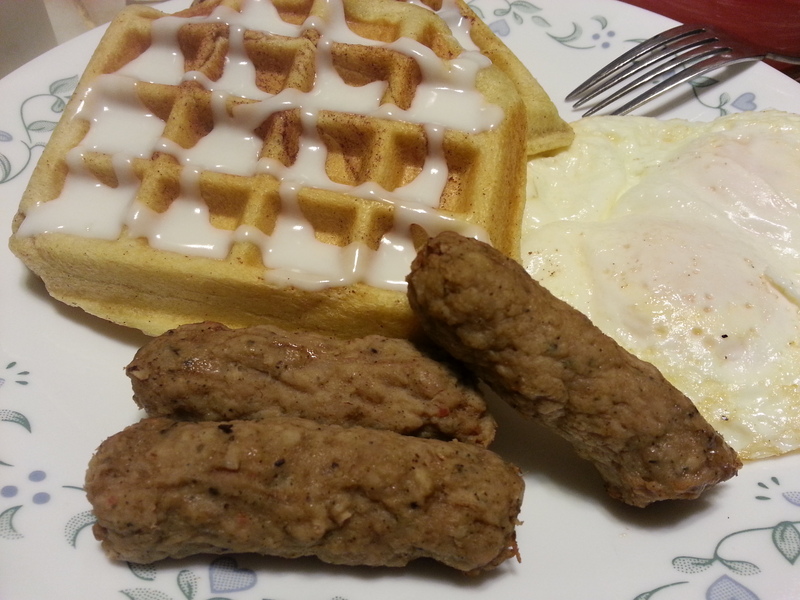 The spiciness of the sausage went very well with the sweet cinnamon rolls. This isn't really a recipe. It's more like alternate cooking instructions. Give it a try. You'll be glad you did. 1 package of the larger sized cinnamon rolls that come 5 to a package. More than one package if you're cooking for a larger group. Place single cinnamon rolls into the well of the waffle iron where each waffle is formed. This will be 2 to 4 cinnamon rolls at a time depending upon your waffle iron. Cook cinnamon rolls until the waffle iron indicates that they are cooked. Ours required 3 - 5 minutes per waffle before the light went out again.